If your idea of a holiday is where you can enjoy splendid scenery, visit historic towns, see the local culture being displayed at many festivals, and possibly spend some time enjoying the beaches, or walking around the cliffs, and along quiet country roads, or playing golf, and last but not least tasting real local food Look no further. Come to La Julerie and enjoy all of these pastimes and ways of life in Le Côte D’Armor. 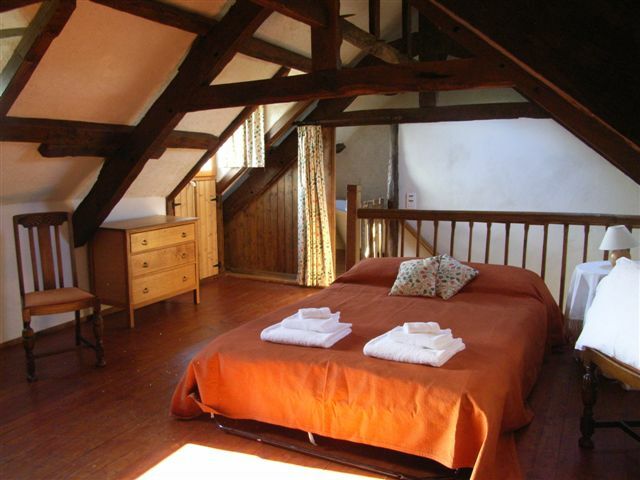 We have converted the farm longhouse and stables at La Julerie into 4 Gîtes. 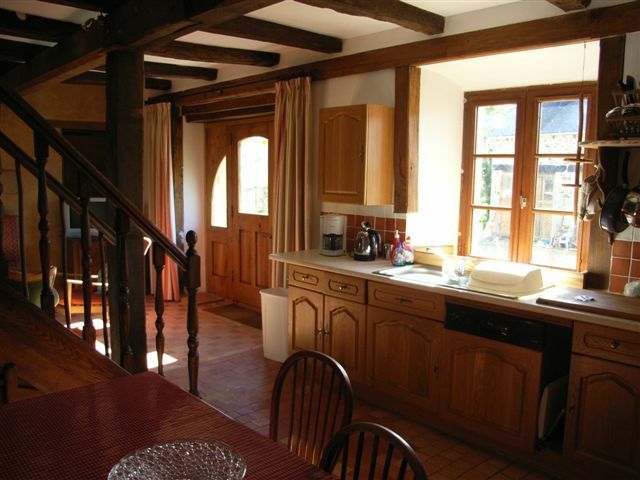 Each cottage has been individually re-created in the Breton style and we have taken great care to ensure that all the beautiful original timbers are exposed throughout, but at the same time have equipped each cottage with fitted kitchen, comfortable chairs and sofas & French/English TV, DVD players, wooden patio tables & chairs & barbeque equipment. The barn has been converted into a large games/leisure room with a table tennis table, a seating area, sit on toys for the younger children and books and games for all; there are 2 shower changing rooms and also a small kitchen and a toilet; guests have held their wedding receptions, anniversary parties etc in this large leisure room and adjoining the this large room we have installed a heated indoor swimming pool, but one with its own glass retractable cover, so in hot weather it is converted to an open air pool. Surrounding the pool there is an enclosed patio with lounging seats for our guests. La Julerie slopes gently to the south and is a natural suntrap. As there are no other properties on the road to La Julerie and with space in our yard many guests bring their children’s cycles to use around La Julerie. We have now listed over 60 types of birds and there are many swallows flying around the buildings throughout the summer; they still nest in some of the buildings. At night time you may are more likely to hear owls than cars. Le Grenier has 3 en-suite bedrooms, on the first flloor there are 2 double bedrooms, one of which has a bathroom and the other has a shower room, on the upper floor the family bedroom has 2 single beds and also a settee bed which converts to a full size double bed; its en-suite bathroom is everyone’s favourite with its French styled stand alone bath (with shower attchments) bidet, basin and toilet. There is a washroom at the rear on the groundfloor. 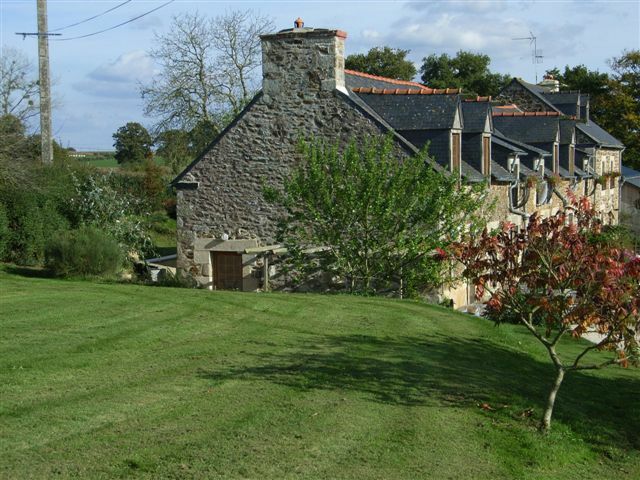 With central heating and also a wood-burner this will make ideal holiday accommodation all year. 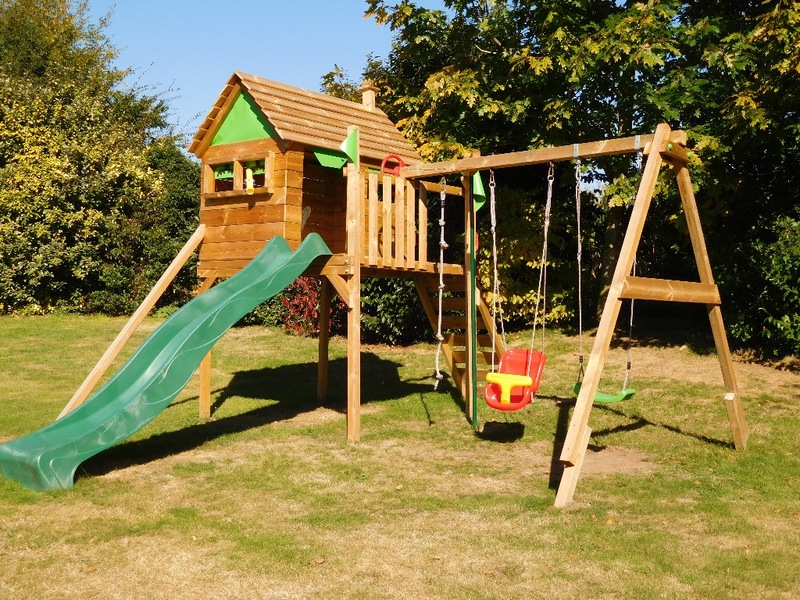 We have an elevated playhouse with swings, a slide & a fireman's pole for the children and also another groundlevel playhouse alongside the sandpit for the younger children. We do cater for weekend breaks and holidays of less than 7 days apart from during july & August. Please not that for all bookings of less than a full week, guests will be charged for 1 night longer than they stay. We have virtually all of the equipment that parents need when taking their children on holiday; please ask for details of all the items you will not need pack! Lydiane, our French daughter in law has her own hair salon across the yard from the gites and will take care of the hair of any of our guests during their stay. Wedding guest please book before arriving, but others can decide after arrival! As a member of Brittany Ferries travel club I am able to get all of our guests 20% discount on their ferry tickets when travelling with this company. La Julerie is only 18km (about 20 min drive) from the coast which offers a large number of safe sandy beaches, which is what all children adore; several beaches offer sailing, and all types of surfing schools –wind, kite and sand yachts; just what the teenagers and more adventurous adults enjoy. There are many offshore islands well worth a visit at low tide, for the whole family to enjoy. We know from experience that the young children really enjoy looking in the ponds as the tide recedes for little fish and shrimps and crabs, and also collecting some of the lovely shells to be found in the sand- quite often we just reach the island and find it is time to return ahead of a rising tide- but always with really happy children! La Julerie is only 10km from the historic town of Dinan where you can see many medieval buildings, or enjoy their weekly market or wander down a cobbled street to the port and enjoy lunch alongside the river. The world famous Mont St Michel is less than an hour’s drive from La Julerie as is the capital of Brittany- Rennes where you will find museums featuring the history of this ancient part of France. St Malo and Dinard face each other across the estuary of the River Rance; St Malo is a busy port and a centre for yachting but also a hive of activity as a popular tourist centre, whilst its neighbour across the river hosts the annual British Film Festival each September. 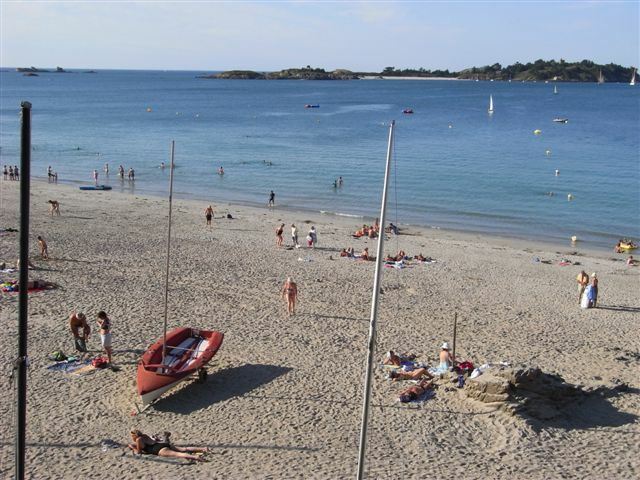 Dinard boasts beach tents for changing in – in 2018! However, at La Julerie we can offer you first and foremost “A Warm Welcome”, and also peace and quiet, where you are more likely to hear owls at night-time thank cars. Leave the port in the direction of Toutes Routes, and this will take you on to the RN137 continue until you have the directions for Rennes, Dinan etc. take this dual carriageway, continue on it until you come to the interchange and can take the road to Dinan and St Brieuc, it is the RN176. you will immediately cross the river (Rance) and see the sign for the Cote D’Armor continue on this dual carriageway until you pass Dinan and then leave this road, it is the 5th exit junction after crossing the Rance at the interchange for VANNES, LORIENT and Caulnes, Broons and Plancoet. Take the D794 toward Plancoet, after about 2 ½ miles you go down a straight gentle hill/incline at the bottom of which there are various Gites de France signs and also bus stops on each side of the road. these are marked St Uriac. At this junction leave the main road turning right and immediately taking the left fork. You will see the first sign by the junction for Lydiane Coiffeuse , you can just follow this sign and the following signs along your route as they will take you to La Julerie where Lydiane’s salon is . Once unloaded we would ask you to park in the area designated for parking, away from the cottages across the drive. Motorway, although it is termed a motorway it is just a good 3 lane or dual carriageway. The road is the N176/N175 keep on it, taking care not to take the Fougeres road, do not turn off to Mont St Michael nor St Malo, nor Rennes, eventually you will see signs for Dinan and St Brieuc. Continue on it crossing the river Rance, once over the bridge you will be welcomed to the Cote D’Armor, stay on this road until you pass Dinan and then leave this road (it is the 5th exit junction after crossing the Rance) at the interchange forVANNES, LORIENT and Caulnes, Broons and Plancoet. If your idea of a holiday is where you can enjoy splendid scenery, visit historic towns, see the local culture being displayed at many festivals, and possibly spend some time enjoying the beaches, or walking around the cliffs, or along quiet country roads, or playing golf, and last but not least tasting real local food Look no further. Come to La Julerie and enjoy all of these pastimes and ways of life in Le Côte D’Armor. La Julerie is only 18km from the coast which offers a large number of safe sandy beaches, which is what all children adore; several also have sailing, and all types of surfing schools –wind, kite and sand yachts; just what the teenagers and more adventurous adults enjoy. There are many offshore islands well worth a visit at low tide, for the whole family to enjoy. Plancoet is only 9km from La Julerie and is the location of the Crouzil restaurant, where Jean-Pierre Crouzil is your chef “Restaurant breton | Restaurant de cuisines de France | Restaurant gastronomique” this in itself enough of a reason to visit Le Côte D’Armor. Gite , 117 sq. m.
Our tariffs are fully inclusive of all bed and bathroom linen, kitchen towels etc and also swimming towels, free use of bikes on a daily basis and payment of the local holiday tax.